PM Thread Opener to be added. "Bella, I can’t live in a world where you don’t exist." 136. Because he just wants to keep her safe. 137. Because their looks for each other say it all. 138. Because all their best days and nights have been with each other. 139. Because their love is epic. 141. Because their love is bigger than life. 142. Because they made us love them since the first scene. 143. Because he will love her forever, every single day of forever. 144. Because he waited a century for her. 145. Because he wants to spend an eternity with her. 146. Because he bought a motorcycle to ride side by side with her. and I know I’ll never be strong enough to leave again." Click the art for the fan fic links. Click the art for the fan vids. altered as I was. As I would always belong to him, so would he always be mine." Click the art for the book quotes. "Does Bella's relationship with Jacob devaluate her love for Edward?" "Not for me. For me, it makes that perfect true love stronger. Bella has another option. 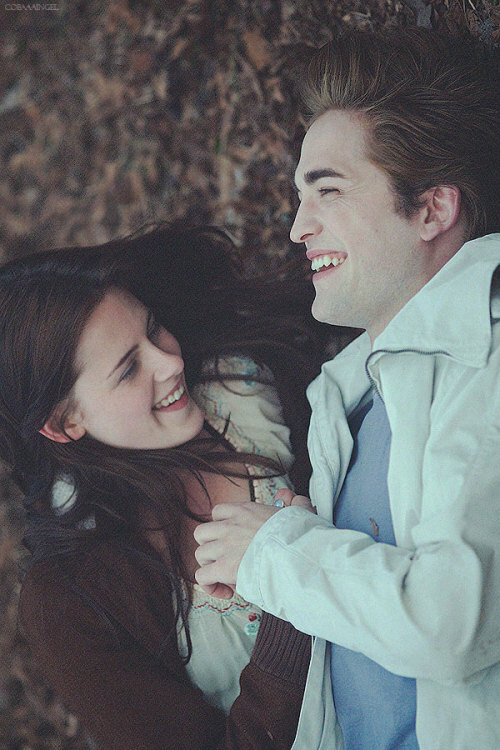 "Bella and Edward could capture their love forever young. Why not! He's been waiting for someone like her for DECADES. And she loves him. forward to meet my fate, with my destiny solidly at my side." The Intensity, Inevitability and All That Comes Between of Edward and Bella Cullen. she’s completely infatuated by him yet he’s seemingly repulsed by her. He holds a secret, one too dangerous for him to confess, but one too alluring for her to ignore. joyously real relationship. It’s the one thing they have that’s worth fighting for, and to have love – to experience such overwhelming and life-altering emotions – is to know that you’re truly alive. As New Moon shows: where there’s happiness, there’s a price to pay. As all great lovers come together, so they must be torn apart. her blood provokes a violent reaction from Jasper, and everyone must intervene. Reality hits harder than ever: Bella is human, Edward is not. Their worlds in this sense are too far apart. And so they face the cruellest of all break-ups – figuratively speaking, he leaves his heart behind, and takes hers with him. “Love, life, meaning... Over.” Except it’s not over, because they’re still with each other: distance and time cannot break their bond; physical separation does not alter their feelings. Bella retreats into a state of depression for several months, until a strong friendship forms between herself and Jacob Black. It helps, but doesn’t heal her wound. to inform Bella that Edward is seeking out the Volturi because he believes Bella to be dead, and wants to die too. Determinedly, she rushes to Italy to save him. "I'd never seen anything more beautiful - even as I ran, gasping and screaming, I could appreciate that. And the last seven months meant nothing. And his words in the forest meant nothing. And it did not matter if he did not want me. I would never want anything but him, no matter how long I lived." "It was very strange, for I knew we were both in mortal danger. Still, in that instant, I felt well. Whole. not healed, but as if there had been no wound in the first place." she wants to be with Edward forever, but he still refuses to change her. In ideal circumstances, he would give anything to become human for her. but later, when she realizes she loves Jacob beyond friendship, everything seems uncertain. Edward, on the other hand, thinks of nothing but Bella’s happiness. they never were. They want and need every part of each other; it’s the only way they can live. This alone, determines Bella’s future. There was never a choice with Edward, never a chance in their love wavering even in the slightest; they are still and evermore shall be the most important people in each other’s lives. Thus, the engagement remains certain, they decide on a date, and the only thing left to fear? ...Telling Charlie the good news. marking a truly perfect moment in their journey so far; and in pivotal fashion, on the first night of their honeymoon, Edward finally consents and makes love to Bella. As a result, Bella gets pregnant. Being a vampire, Edward understandably assumes the worst, and can’t even acknowledge the possibility that a human child is inside her. against any active threat. Her family make peace with the Volturi, and so Edward and Bella are free to exist in peace with their half-human/half-vampire daughter, Renesmee. Coming full-circle, their closure comes in the form of Bella using her ability to show Edward flashes of her treasured memories, which amazes him beyond belief. but without any trace of doubt, belong to each other. I was with Edward. Forever." Click here for the rest of the icons. "You may be brave enough or strong enough to live without me, if that’s what’s best. But I could never be that self-sacrificing. I have to be with you. It’s the only way I can live." Two souls. One love. Forever united. "Now you know. No one’s ever loved anyone as much as I love you." Because if Kristen could change anything about Bella, she'd "make her a vampire." Because that distracting!Bella wig doesn't stop the EB chemistry. Because intense never looked so hot. Because their make-out scenes heat up in Eclipse. Because if we can't resist Edward hot voice in the trailer, we can't imagine how Bella feels. Because she shot across his sky like a meteor. Because she was the sun in his dark life. Because when moonless night left the beauty light, there was no more reason for anything. Because only Edward can call her Isabella and get away with it. Because forever is not long enough for the eternity love story of EB. Because only Edward has the dazzling effect over Bella. Because he wants her to make the choice that will make her happy. Because he doesn't care about anything other then her having true happiness. Because "I'll hurt myself to keep from hurting you, to keep you safe. " Because it tortured them both to be away from each other. Because "It's like you've taken half my self away with you." Edward to Bella - "You're intoxicated by my very presence." Because "Even if you cannot hear my voice, I'll be right beside you dear." I don't know if life is greater than death, but love is greater than both. Do not mistake coincidence, for fate. I do not want to make reasons for you to stay, only reasons for you to return. I desire nothing more than to be in your heart until forever dies. Because "At least I could be with him again before I died. That was better than a long life." Because "I thought I’d explained it clearly before. Bella, I can’t live in a world where you don’t exist." Because "After all the thousand times I’ve told you I love you, how could you let one word break your faith in me?" Because "as if there were any way that I could exist without needing you!" Because "When I told you that I didn’t want you, it was the very blackest kind of blasphemy." Because "I don’t trust myself to be… enough. To deserve you. There’s nothing about me that could hold you." Because "Well, I’m nearly a hundred and ten. It’s time I settled down." Because "I don’t make the same mistake twice. I’m here until she orders me away." Because "Edward was here, with his arms around me. I could face anything as long as that was true." Because no one has every loved anyone as much as Bella loves her husband. Because 1 day seems like nothing when i get to spend forever with you. Because I'd give up anything to be just like you; i'll give you my soul; i love you. Because You don't know how long i've waited to be able to call you my wife; Bella Cullen. Because there's just no life without you. Because "Eyes, look your last. Arms, take your last embrace. And lips..O you the doors of breath. Seal with a righteous kiss." That would be wicked if we did that...! !